* This review contains spoilers for the previous books in the Bloodlines series. To Sum It Up: Sydney and Adrian have been granted sanctuary at the Moroi Court, but while this means that Sydney is relatively safe from the wrath of the Alchemists, neither she nor Adrian can do much to assist in the search for a missing Jill. Sydney may be forced to venture outside of Court, however, when it appears that Jill’s abductor is a past enemy of Sydney’s and out for revenge. While Adrian worries about Sydney falling back into the Alchemists’ hands, she in turns fears the consequences of his continued use of spirit. Review: It’s time to say goodbye to another favorite series of mine—Bloodlines. I feel especially sentimental about this one coming to an end because the first Bloodlines novel was the very first book that I reviewed on the blog almost three years ago. Ah, the memories. When I began reading this series, I remember being a tad skeptical of Sydney’s ability to anchor the series as the protagonist. Following in the thunderous footsteps of Vampire Academy’s Rose Hathaway isn’t easy, but Sydney quickly grew on me. Of course I’d already fallen in love with Adrian back in VA, so seeing him with a prominent role in Bloodlines instantly won my heart over to this series. Watching both characters develop tremendously over six books, as well as watching the relationship between the two of them blossom, has been the highlight of the series for me. 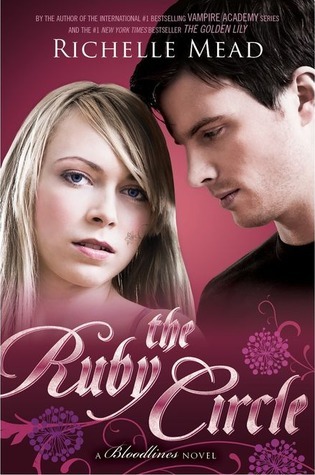 I just had to gush about Sydrian for a minute, but now I’ll attempt to gather some focus and home in on the particulars of The Ruby Circle. Something I noticed when I plucked my copy from the shelf was that it seemed on the slim side for a series ender. It’s just under 350 pages, and although I try not to judge books by their page counts, I was still a little surprised. Were all of the plotlines going to be wrapped up by the end? In response to that question, I would say—mostly. While I was very happy with the conclusion of The Ruby Circle and I think longtime fans will be, too, the book also drops a revelation that leads me to believe we haven’t seen the last of these characters. So I’d call this an ending that isn’t quite an ending because it leaves at least one door ajar for a spin-off of a spin-off. And obviously, I would totally read that. This has turned out to be a bit of a tricky review to write, because despite enjoying reading this, it didn’t wow me as much as the previous novel, Silver Shadows, did. There was a definite comfort in being in the company of Sydney, Adrian, Eddie and their friends one last time, but the plot of this one, which centered around the search for Jill, wasn’t as compelling as the search for Sydney in Silver Shadows (no offense meant to Jill). Perhaps it was because in the latter, we knew exactly what was happening to Sydney firsthand in that horrible Alchemist re-education hellhole. This is my best effort at explaining my feelings toward The Ruby Circle: it hit some very sweet spots that reaffirmed my love for the series as a whole but wasn’t quite the page-turner that some of the other Bloodlines books have been. All in All: Although I’d expected a little more from The Ruby Circle—more suspense, more tension, and maybe even a few more pages, the series wrapped up very nicely.